It’s 10:30 a.m. on a summer Wednesday at Taylor Hoang’s new side-by-side restaurants in Redmond. With the lunch rush looming, Hoang walks with purpose, her eyes focused on catching mistakes before they happen. As usual, her morning is packed, her attention divided between a server in training, a takeout order to fill and a chef who needs a hand in the kitchen. She sits down for our interview, a mug of jasmine tea in front of her. Maxwella Cafe & Bar and District 1 Saigon anchor the ground floor of a new apartment complex, with a banner out front bearing the slogan “Live Modern. Live Up.” Hoang chose this spot on this street in Redmond for its potential. Construction sites surround the apartments. The Microsoft campus is less than five minutes up the road. A new light rail station set to open across the street in 2023 will connect Redmond with Bellevue and downtown Seattle. A new hotel next door brings in visitors connected to Microsoft and other eastside tech companies. At Maxwella, a modern take on a French cafe with high ceilings and exposed ductwork, customers eat breakfast and peer into laptops. Construction workers in orange vests trickle in to for coffee and pastries to go. The restaurant is named for Hoang’s children: Maxwell, 6, and Ella, 9. 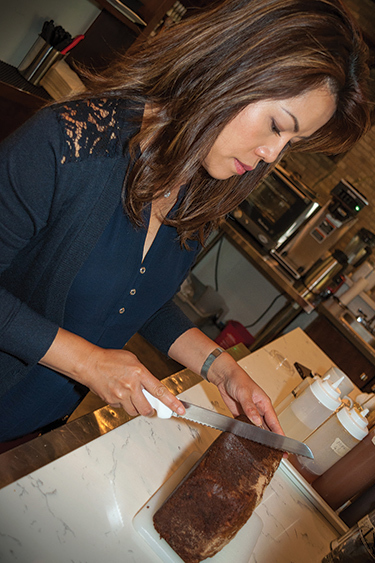 Hoang uses terms like “market share” and “growth potential” to describe her new restaurants. She chafes at what she says is a stereotype that lumps all so-called ethnic food together as “cheap eats.” Fresh ingredients and traditionally prepared food, for example, take time and money. Pho broth requires eight to 10 hours of simmering beef or chicken bones to break down the collagen and extract the rich flavor prized in the traditional Vietnamese soup. That’s an investment she believes customers appreciate and are willing to pay for. “When you have good food people will seek you out,” she says. Hoang, UW Bothell’s Distinguished Alumna of the Year for 2018, is spending four or five mornings a week in Redmond, guiding her newest eateries through these treacherous first months and making sure they stay true to her vision. But in recent years, she has also put herself at the center of some of the area’s most heated political debates. Underlying it all, is city of Seattle’s efforts to address the city’s affordability crisis and how those efforts might help or harm small businesses. Since the campaign to raise Seattle’s minimum wage to $15 an hour, Hoang has been outspoken about what she considers the city’s increasing hostility toward small businesses. “I’ve gotten … regulation fatigue,” says Hoang, who graduated with a business degree from UW Bothell in 2002. In 2015, she sold one of her four Pho Cyclo Cafe restaurants in Seattle and closed another last year. The rising cost of real estate, in addition to new laws, make doing business in Seattle too expensive, she says. In particular, she cites the recent ban on plastic straws, the new soda tax, the $15 minimum wage and a proposed employee head tax on businesses with annual revenues over $20 million. The restaurateur’s road to small-business advocacy was a long one. Hoang’s father, a soldier in the South Vietnamese Army, escaped to the United States in 1975. Hoang and her mother, Lien Dang, stayed behind, and Hoang lived with her grandparents while her mother was forced to live in a Communist re-education camp for several years. In 1982, when Hoang was 7, she and her mother joined Hoang’s father. The family settled in Everett, but Hoang grew up at her mother’s restaurant, Huong Binh, in Seattle’s Little Saigon. Her time after school was spent snapping peas, peeling garlic and waiting tables. Hoang’s mother, now 65, still works seven days a week at her own restaurant. She also makes the pickled vegetables featured on District 1’s menu. “My mother can’t sit still,” Hoang says. “She always, constantly has to be doing something.” The pickling recipe for mustard greens comes from Hoang’s grandmother. to promote small businesses owned by immigrants and people of color and help them navigate local laws. Last year, Mayor Jenny Durkan appointed her to the city’s new Small Business Advisory Council. Hoang believes the $15 minimum wage—the highest in the country—is particularly challenging for immigrant-owned small businesses, which are often already operating on thin profit margins. She echoes a refrain among opponents of a higher minimum wage who say employers—especially smaller businesses—will be forced to cut jobs, ultimately hurting workers. She acknowledges that immigrants also make up a large percentage of low-wage workers in the city’s restaurants, warehouses and retail shops and would benefit the most from a higher minimum wage. “That…was a very difficult conversation,” Hoang says. “We kind of pointed out to policymakers that, yes, we want to support this, but at the same time we also can’t forget” that immigrants are business owners, too. A higher minimum wage also disrupts the informal system of support immigrant business owners have traditionally provided for newcomers, Hoang says. “Immigrants are the very ones who are starting businesses and giving opportunities to other immigrants to get jobs and get into the workforce,” Hoang says, adding that she’s watched her mother struggle to keep up with rising rents and labor costs at her restaurant. In March, Hoang was at the forefront of the city’s small-business owners who joined Amazon, other large companies and neighborhood groups to oppose the controversial employee head tax. The tax, applied to business with revenues above $20 million, intended to raise $47 million annually from 2019 to 2023 to pay for affordable housing and services for the city’s growing homeless population. Hoang led a group of more than 300 small business owners who signed a letter to the city council in opposition to the proposal passed by the council in May and revoked less than a month later. With her tea mug still full, Hoang moves toward the kitchen to answer a question from the chef. At the prep station, she washes her hands, puts on gloves and starts assembling spring rolls. She dunks the round wrappers in hot water and fills them with shrimp, rice noodles, bean sprouts, lettuce and cilantro. Hoang wanted to offer a different kind of Vietnamese cuisine, one more reflective of the variety of flavors and influences available in the dynamic neighborhood in Ho Chi Minh City from which her restaurant, District 1, takes its name. She lived in the neighborhood from 2004 to 2009 while founding and running a company to help coffee farmers in Vietnam switch to growing a more profitable type of bean. A neighborhood where colonial buildings, side-street food stalls, temples and pagodas stand alongside luxury hotels and skyscrapers, the original District 1 is at the heart of Ho Chi Minh City and the center of Vietnam’s turn toward the global economy. “Culture, commerce and capitalism are at the forefront of the district’s drive for growth,” according to the restaurant’s website. Hoang describes the neighborhood as an international food mecca. “You can have street food, amazing tapas, Indian food, Thai. It’s like New York City,” she says. Some of this variety is what Hoang is aiming for with dishes such as braised lamb chops served with pickled pearl onions or mustard greens and grilled pork rolls. “That gives me leeway to kind of play with the food,” Hoang says. With tables filling up and the lunch rush beginning, she looks at her watch, smiles and suggests we wrap up the interview. She has work to do.